In this time of uncertainty, I feel that we Americans need to remember those who have given their lives in defense of this country. This is not a political statement on the current Middle East situation, but an appreciate of those with their boots on the ground who risk their lives daily. As part of that, my wife and I visited the U.S.S. Arizona (BB-39) Memorial at Pearl Harbor during our trip to Hawaii. Unfortunately, rain prevented us from visiting the U.S.S. Missouri (BB-63) Memorial. In front of the gift shop that is inside the Visitors Center was a table with gentleman selling Pearl Harbor commemorative medals and sets produced by the Honolulu Mint. I was very intrigued by the items and gravitated to the commemorative set that contains two .999 Silver, 1 Troy Ounce medals, an uncirculated 1943 Steel Lincoln Cent, and a Series 1935A Hawaii issue Silver Certificate. Even though I am not a commemorative collector, I do tend to buy numismatic items from my personal experiences. While standing in the Memorial, and with my wife’s urging, I could not pass up buying this set. 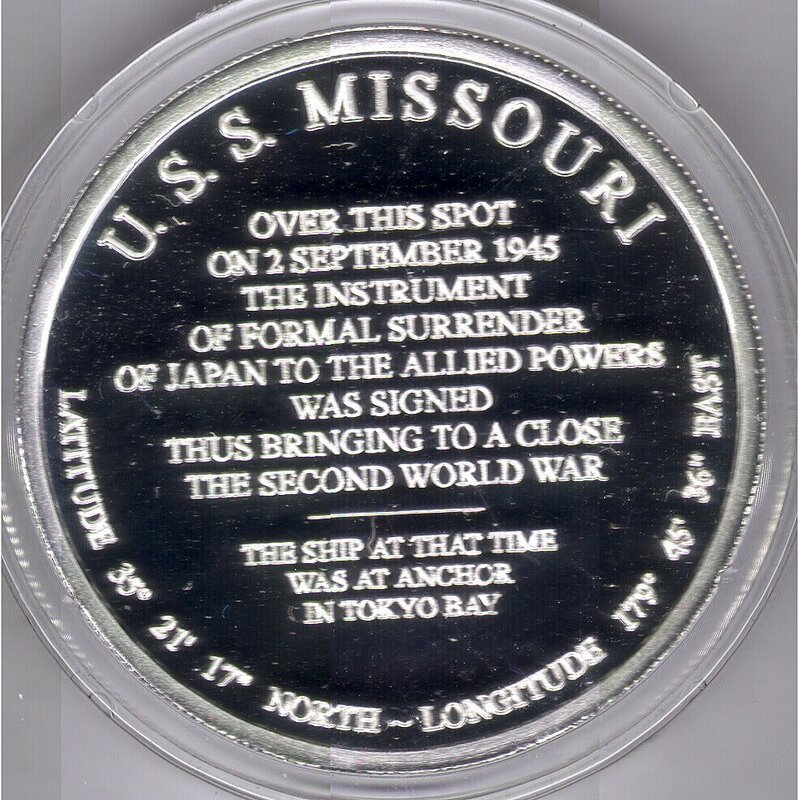 The other medal commemorates the Japanese surrender aboard the U.S.S. Missouri. It was prophetic that the articles of surrender were signed on her deck. The obverse of this medal recreates the signing of the document by General Yoshijiro Umezu, Chief of the Army General Staff, with Lieutenant General Richard K. Sutherland standing across the table. The reverse has the inscription on the deck of the Missouri where the articles were signed. 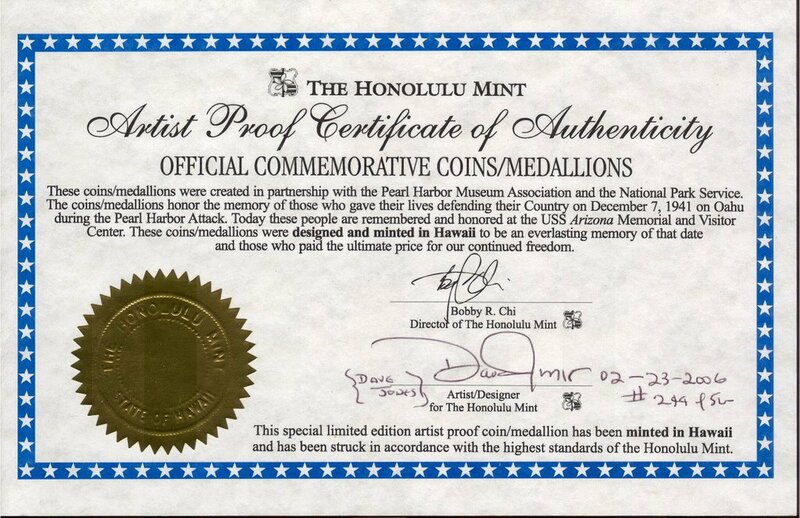 Both medals were designed by the Honolulu Mint’s chief engraver, Dave Jones. I had the honor of meeting Mr. Jones when I purchased the set and personally received his autograph on the Artist Proof Certificate of Authenticity. The images on both medals shows Mr. Jones attention to detail and accuracy with creating these medals. The Honolulu Mint executed the designs flawlessly with fantastic strikes on great looking planchets. Both Dave Jones and the Honolulu Mint deserve much praise for their work. Although everyone should visit the U.S.S. Arizona Memorial and the rest of Pearl Harbor, I know it is not a trip that every can take. 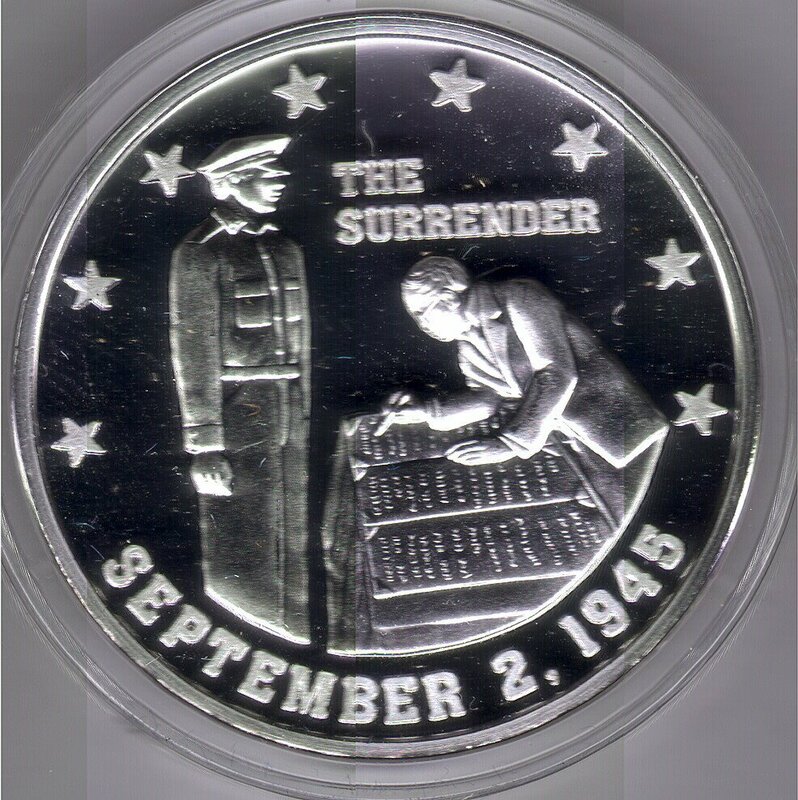 So if you are interested in this collectible and other medals honoring those who served and gave the ultimate sacrifice, you can visit the Honolulu Mint’s website or the U.S.S. Arizona Memorial Bookstore. Portions of the proceeds benefit the Memorial.